It's kind of mysterious, and after watching it, I think I'd be inclined to pick up the book and read it. How about you? 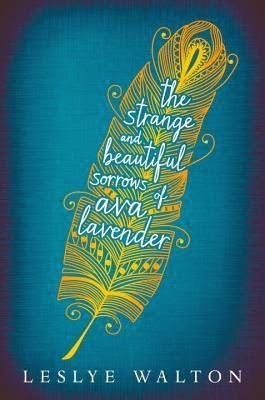 Here's something else, I think the book cover is gorgeous, and it, too, makes me want to pick up the book! (If you'd like to learn more about the cover, click here.) If I'm any indication, this book is sure to be read! Despite what they say about not judging a book by its cover, we all do it! Is a book trailer now the thing you shouldn't judge a book by? What do you think? 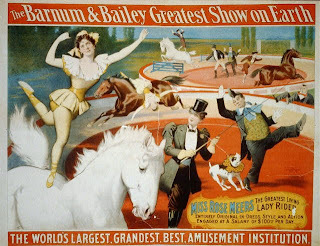 On this day in 1881, the circuses of P. T. Barnum and James A. Bailey, merged to become the "Greatest Show on Earth," so, on this 133rd anniversary, let's take a look at a book of circus poetry. I'm sharing "Wintering" today because it seems as though we'll never be through the winter weather we're still having, despite it's being officially spring. I can only imagine how the performers, roustabouts, and animals of the many circuses that existed during the late 1880s must have felt as they had to endure winter layovers. The Poetry Friday Round-Up is being hosted at A Year of Reading. Next week is the beginning of National Poetry Month--how great is that? 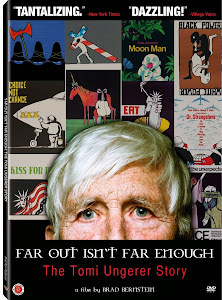 One of the DVD titles we recently added to our collection is Far Out Isn't Far Enough: The Tomi Ungerer Story [DVD B UNG]. Ungerer, a children's author illustrator of some note, also has a personal history that is of interest to adults. He grew up in the Alsace region of France and lived there during the Nazi occupation. His work, as shown in the film, encompasses bizarre humor, erotica, political and social commentary, and his award-winning work in children's books. We have quite a number of Ungerer's picture books from some of his very earliest, like Crictor (1958) to his latest title published in 2013, Fog Island [both found in JP UNG]. Flat Stanley (1964), was written by Jeff Brown, and illustrated by Ungerer [J BRO]. Flat Stanley has been a great favorite in elementary schools where a "Stanley" is created by students and then mailed to other schools or friends far and wide. Click here for an amazing story of one Stanley's 10-year long adventure! Stanley even has his own website! In case you've forgotten about the Library's museum pass program, I want to remind you about the Peabody Essex Museum pass that was made possible by FLOW. The reason I mention this pass in particular is because of a current exhibition called "Beyond Human: Artist-Animal Collaborations." The exhibit deals with artists and the animals they portray, and is something that the whole family would enjoy. William Wegman is one of the artists represented in the exhibit, and you may be familiar with his work. If you don't recognize the name, you'll probably recognize his Weimaraners. To refresh your memory, borrow one of the picture books in our collection. The latest one is Flo & Wendell [JP WEG]. The exhibit runs through September 7. To book the Library's pass, you'll need your library card. Click here to begin, or give the Library a call at 432-7154. Do You Sometimes Get the Feeling We're Living in the Antarctic? If you're traveling and end up in South Africa, you can sunbathe with penguins! Read more here. After watching the above video however, you might end up with a bunch of penguins falling all over you! 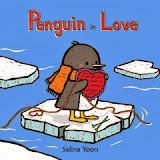 Penguins are perennial favorite subjects for children's picture books, here are just a few penguin titles published within the last two years! We have the capability of creating slideshow-like features in our catalog. These are known as carousels. When you log into the library catalog, these will show up on the first page. We currently have two carousels, one with newly added adult fiction titles, and the other for new children and young adult titles. We also can create a carousel for a webpage or a blog. As an experiment, and since it is spring, I've created one for spring flowers. For today, I have an interesting little poem by W. B. Yeats, about something he MADE, and yes, the "made" part is all in caps, just as if he were shouting it! Found in Poems to Read: A New Favorite Poem Project Anthology [808.81 POE], as well as in several collected works of Yeats found in 821 YEA. This is an interesting poem that is definitely open to different interpretations. And I believe it is a poem about interpretation, itself. Yeats' song is misinterpreted and misappropriated by others who think they know what he is saying. For him, it is better to be unclothed than to be covered in others' misconceptions. I think "A Coat" would be a good choice for a discussion, if only discussion groups for poems were as common as they are for books. The Poetry Friday Round-Up for today is being held at The Drift Record. Illustrations by Jack B. Yeats from Irish Fairy Tales edited by W. B. Yeats . I've been thinking a lot about color lately, probably because I've been experimenting with photo editing software. I don't think I tend to favor any one color over another in my creative pursuits, but I do find my attitude subtly changing when confronted by colors in my surrounding. You may have noticed this, too. There has been much written about color and its psychological effects. One book that comes immediately to mind has the delightful title of Drunk Tank Pink: And Other Unexpected Forces That Shape How We Think, Feel, and Behave by Adam Alter [155.9 ALT]. It is not exclusively about color, but it does devote a chapter to it. Another that we recently added to our collection is ROY G. BIV: An Exceedingly Surprising Book about Color by Jude Stewart [155.911 STE]. from the "Introduction": ROY G. BIV is bursting with actual color--the illustrations you see sprinkled throughout the book. These visuals are intentionally abstract: color in its purest form. Free of any context, color is gorgeous, suggestive, but never specific. So how do you decode it? The book is a fun way to spend a few hours. It helps you decode and appreciate color. It lets you question the associations you've always had with certain colors. And, most importantly, it makes you more aware! Color theory and therapy is a big part of our culture and experts have taken up the task of leading us in the right direction in its use. For example, color specialist, Leatrice Eiseman, wrote Colors For Your Every Mood: Discover Your True Decorating Colors [747.94 EIS] so that we needn't make a decorating faux pas! That should be rephrased as, "what plate are we on?" --what tectonic plate, that is! You probably know a little something about plate tectonics and the shifting of the Earth over eons. 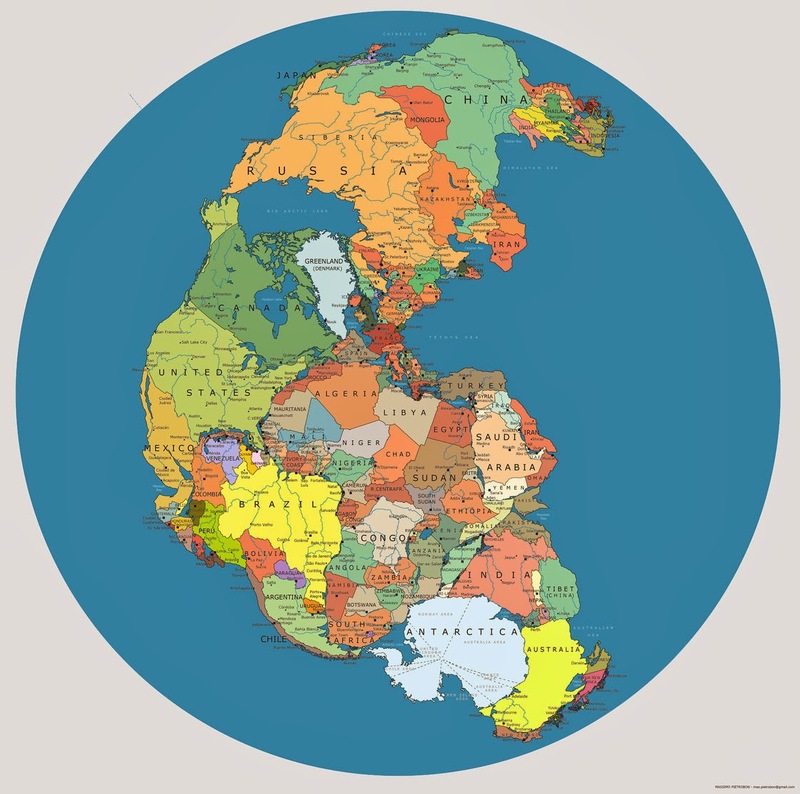 Last fall, Robert Krulwich, of National Public Radio, did a little speculative thinking piece about what it would be like if the Earth today looked as it did 300 million years ago! Read Krulwich's article, study the several maps that are included, then come borrow How the Earth Was Made [DVD 551.7 HOW], a History Channel multi-set series that covers plate tectonics and continental drift, and be prepared to learn a whole lot more about how the Earth changed! Not only is DiCamillo prolific, she is also extremely talented! And, most importantly, her books are beloved by children, and not simply by the adults who give out awards. When ten-year-old Opal returns home with a stray dog she names Winn-Dixie, things begin to change in Naomi, Florida, the sleepy town where Opal and her father, a reticent preacher, have recently settled. Winn-Dixie helps Opal make friends with the endearing outcasts of Naomi, including a woman rumored to be a witch; the elderly town librarian, who gives Opal candies that taste like melancholy; and an ex-con musician who runs the local pet store. Others of DiCamillo's books include The Tale of Despereaux: Being the Story of a Mouse, a Princess, Some Soup, and a Spool of Thread, and a series about a pig named Mercy Watson. The story of a young rebel soul band from the Dublin ghetto, and their struggle to make it in the music business. The sons of the Phelan family--two farmers, a schoolteacher, and a priest --are torn between nonviolent protest and bloody revolt during the Irish potato famine of the 1840s. 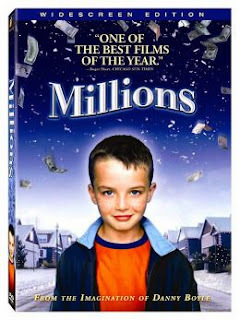 Two motherless brothers, Damian and Anthony, suddenly find themselves the beneficiaries of a seeming miracle: a bag of money drops from the sky onto a fort Damian has constructed out of cardboard boxes. In a remote medieval outpost of Ireland, young Brendan embarks on a new life of adventure when a celebrated master illuminator arrives from foreign lands carrying a book brimming with secret wisdom and powers. To help complete the magical book, Brendan has to overcome his deepest fears on a dangerous quest that takes him into the enchanted forest where mythical creatures hide. An orphaned boy named Tomas is adopted by Maire O'Donnell to live on a whimsical Irish isle filled with new friends, secret caves and a lost baby pup seal stranded on the coast. But when Maire's reluctant husband Alec refuses to accept Tomas as his own son, the boy drifts down a fateful path of adventure and self-discovery, illuminating how rainbows can shine. A young Tristan sees his parents killed by the tyrannical Irish, who ruled over a fractured Britain after the Roman occupation. Tristan is taken in by Marke, who rules one of the British tribes. Tristan grows up to be a young prince and a mighty warrior. He's believed slain in battle and given a royal funeral on a burning boat set out to sea. But the fire goes out and Tristan washes ashore on Ireland, where Isolde, the daughter of the Irish king, nurses him back to health. The two fall in love and set in motion a tragic tale that's lasted for centuries. Driven by a deep sense of duty and a love for his country, Damien abandons his burgeoning career as a doctor and joins his brother, Teddy in a dangerous and violent fight for freedom. As the Irish freedom fighters bold tactics bring the British to a breaking point, both sides finally agree to a treaty to end the bloodshed. But, despite the apparent victory, civil war erupts and families who fought side by side, find themselves pitted against one another, putting their loyalties to the ultimate test. Today is the day for a celebration of the mathematical constant, Pi, π. Pi Day is so widely celebrated, it even has its own Facebook page! Since it is a day devoted to math, I looked for a π poem to share, but alas, none of the books that I looked at had a poem that specifically mentioned Pi! So, I'm going to share one on the more broad topic of geometry. This one is from Verse & Universe: Poems about Science and Mathematics, edited by Kurt Brown [811.008 VER]. This is my kind of math poem--more about flowers and butterflies than numbers! I was able to find plenty of π poems available online through a simple search on "pi poems." 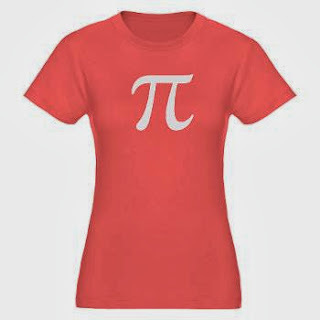 You might want to find one and join in the Pi Day celebration! Kara at Rogue Anthropologist is hosting the Poetry Friday Round-Up today. The tee-shirt is available here. If you're thinking apple, pumpkin, or strawberry-rhubarb, you're wrong. It's a celebration of the mathematical constant, pi, which is expressed by the Greek letter π and is defined as the ratio of the circumference of a circle to its diameter (approximately 3.14...). If you really can't give up the idea of pie, the Pi Day website has pie recipes on its "Things to do for Pi Day" page. It should probably come as no surprise, but we even have a book on the subject of pi called The Joy of π by David Blatner [516.22 BLA]. And what would a celebration be without a laugh? Question: What do you call 3.14% of all sailors? Look at these dresses featured on Winterthur Museum's "Costumes of Downton Abbey" exhibition page. Aren't they exquisite? Photograph © Nick Briggs, Carnival Film & Television Limited, 2012. All Rights Reserved. The Museum also has a series of brunches and afternoon teas planned. Delaware is a little too far to travel just for tea, but, you can plan a tea party of your own, and prepare a few of the recipes found in The Unofficial Downton Abbey Cookbook: From Lady Mary's Crab Canapés to Mrs. Patmore's Christmas Pudding: More than 150 Recipes from Upstairs and Downstairs by Emily Ansara Baines [641.5 BAI]. 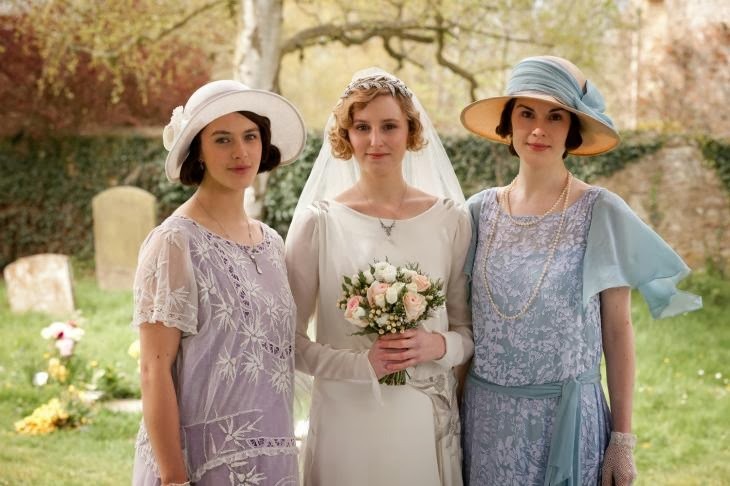 If you'd like to dress up in the style of the 1920s (the period the series has progressed into), borrow Fashion of a Decade: The 1920s [391.009 FAS] to familiarize yourself with the outfits of the period. Now that season 4 has aired, it is time to start thinking about season 5. We've got plenty of time to do that in, since we won't get to see the new season until January 2015! It's about time to again mention the statewide READS-TO-GO program which provides kits for New Hampshire book discussion groups. 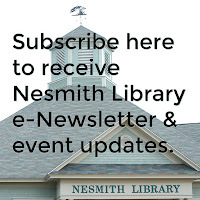 A group can go to the local public library, in this case, Nesmith Library, and ask what kits might be available for borrowing by a Nesmith Library cardholder. A kit contains 15 paperback copies of a discussable title, fiction or nonfiction (in some cases there will be 14 paperbacks and one large print copy). Also included are discussion questions and a sign-out sheet. The books come in a sturdy green canvas bag. These are only a few of the titles that were added to the kit program in 2013! There are currently more than 120 titles in the program! For titles, discussion questions, and other information, visit the READS-TO-GO site. The program is part of New Hampshire Library Association's READS section. If your book group, or local organization would like to consider sponsoring a kit, the cost is approximately $180. Titles are vetted by the READS-TO-GO Committee and assigned to host libraries, which then store the kits and manage bookings. If your group sponsors a kit, it gets the first booking! Last summer, the Windham Woman's Club donated funding for two kits, The Art Forger by B. A. Shapiro, and A Land More Kind Than Home by Wiley Cash, for which the book groups of NH are very grateful! How many of you can still sing a tv theme song from your youth? I've got plenty that will forever remain in the recesses of my mind and may be brought out at any time! I know many a person my age who can sing "The Gilligan's Island" theme song! Or, slightly younger ones who know all the words to theme for "Saved by the Bell." This is all by way of introducing a short video of a whistling cockatiel! 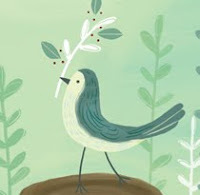 The cute little bird is whistling the theme song to the popular Japanese kids' film, My Neighbor Totoro. My Neighbor Totoro made its way to the United States, and there's many an American young adult who viewed it growing up. It is still fairly popular--we own two copies of the movie [J DVD MY]! Whenever I watch it, I smile, and smile, and smile. That's endorsement enough for me! Poetry Friday--Happy Birthday, Kenneth Grahame! Tomorrow is the 155th anniversary of of the birth of Kenneth Grahame. 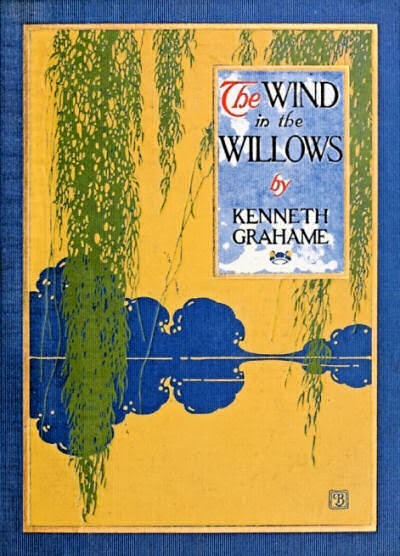 Grahame is probably most famous for the delightful novel for children, Wind in the Willows [J GRA]. I did a book report on The Wind in the Willows, back when I was in fifth grade. 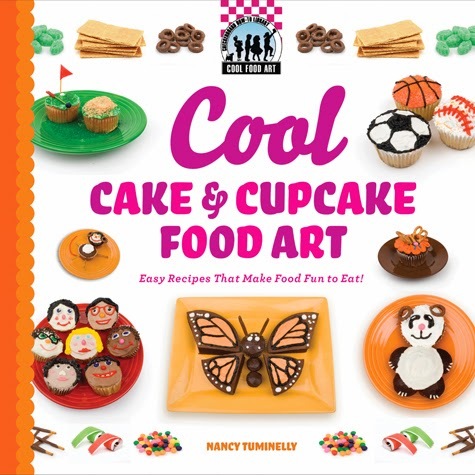 I remember being so proud of the illustration I did for the cover! This cover was illustrated by Paul Bransom and was published in 1913 by Charles Scribner's Sons. Courtesy Project Gutenberg. He got so puffed up with conceit that he made up a song as he walked in praise of himself, and sang it at the top of his voice, though there was no one to hear it but him. It was perhaps the most conceited song that any animal ever composed. Happy Birthday, Mr. Grahame, and thanks for the fun! More fun is in store at the Poetry Friday Round-Up being held at Reflections on the Teche. The Nesmith Library Pinterest account does not have a baked goods board, so we won't take the blame for any of the disasters found here. Many of these disasters could have been avoided if the Pinterest browser had clicked on the link, found the recipe, and, this is the important part--followed the directions! Last week, while getting out of my car in Salem, this giant thing swooped by me. The second I saw its red head, I knew it was a woodpecker. For more information about the pileated woodpecker, click here, and Audubon magazine has an article, "7 Weird Facts about Woodpeckers" here. Along with general field books on birds in our adult section, we also have several books in our children's section that deal specifically with woodpeckers. 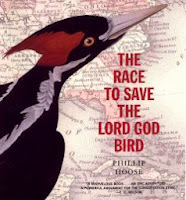 Look for The Race to Save the Lord God Bird by Phillip M. Hoose in the J 598.72 section. Anne Frank has long been a subject of interest, especially to teens who try to imagine themselves in a situation such as Anne was in--secreted away, growing, changing, and always in danger. The Anne Frank Museum, set up in Amsterdam to document her short life, at the Anne Frank House, played a role in the wildly popular young adult novel by John Green, The Fault in Our Stars [YA GRE]. 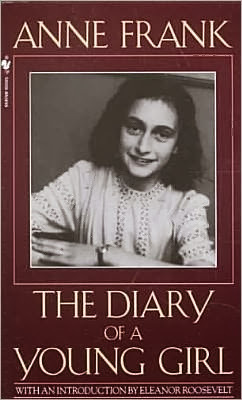 Teens who were unfamiliar with Anne Frank and her diary, which was published as The Diary of a Young Girl [B FRA, J B FRA, or 3M ebook], may be inclined to look for more information about her. Last month the Anne Frank Museum ran an article about a new exhibit, "The Second World War in 100 Objects" to which the museum contributed the marbles that Anne played with before her life in hiding. Read the article here. "Expanding Girls' Horizons in Science and Engineering Month" is sponsored by the Expanding Your Horizons Network. The mission of the Network is to inspire "girls to recognize their potential and pursue opportunities in science, technology, engineering and mathematics (STEM)." 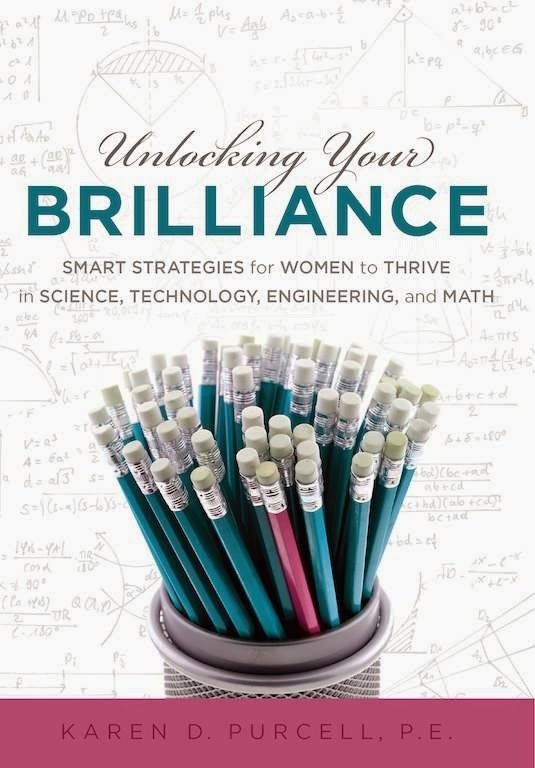 Girls growing up years ago were never encouraged to pursue careers in math and science, in fact, women who wanted a career often encountered great obstacles. In the late 1800s, geologist, Florence Bascom, was only allowed to take courses for her doctoral degree if she sat behind a screen (so as not to distract the men). Microbiologist, Mary Bunting, faced opposition in the 1930s, but she did not give up. She later went on to become Radcliffe College president and to serve on the U.S. Atomic Energy Commission. In 1961 Bunting said, "Adults ask little boys what they want to do when they grow up. They ask little girls where they got that pretty dress. We don't care what women do with their education." We’d like to think that such notions no longer exist in 2014, but it’s not so, and thus, we have designated months like "Expanding Girls’ Horizons in Science and Engineering." One way to encourage girls is to provide examples of women who have succeeded in the STEM professions. Well-written and illustrated books such as Almost Astronauts: The True Story of the "Mercury 13" Women by Tanya Lee Stone [J 629.45 STO, also 3M ebook] provide models for girls, and boys, to emulate. There are also books suitable for the lower elementary-aged child such as The Watcher: Jane Goodall’s Life with the Chimps by Jeanette Winter [JP WIN]. 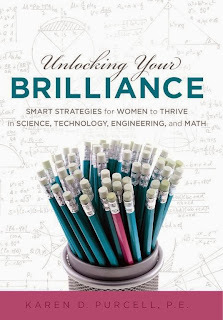 Young adults and adults may find Unlocking Your Brilliance: Smart Strategies for Women to Thrive in Science, Technology, Engineering and Math by Karen Purcell [311.48 PUR] to be of use. If you have an interest in STEM subjects, it is never too late to expand your horizons--male or female.